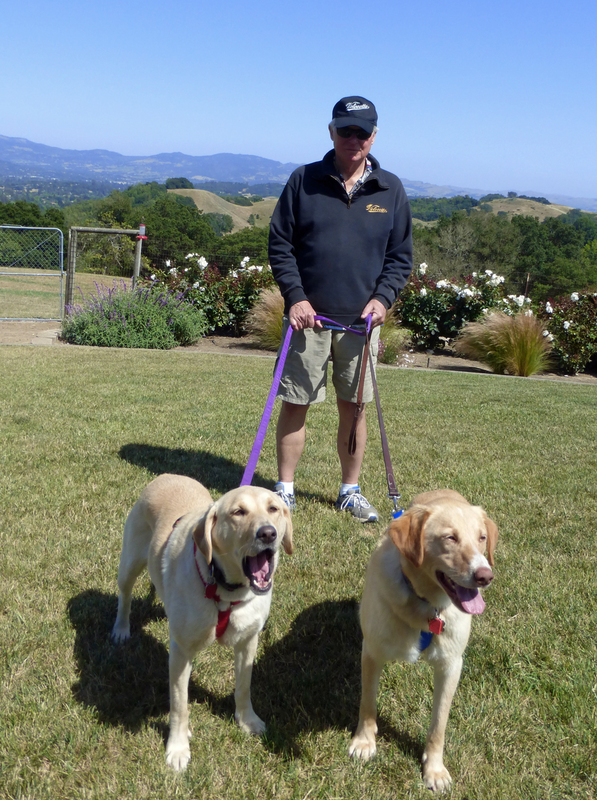 For those of us VOCNA members in Northern California, New Years Eve Eve means a romp through the Napa countryside. Weather permitting of course. This year the weather was glorious: dry with no wind and lots of sunshine and it was the warmest day of the week. VOCNA Chairman John Ray intentionally chose roads that warmed up early so we avoided any ice in the corners. 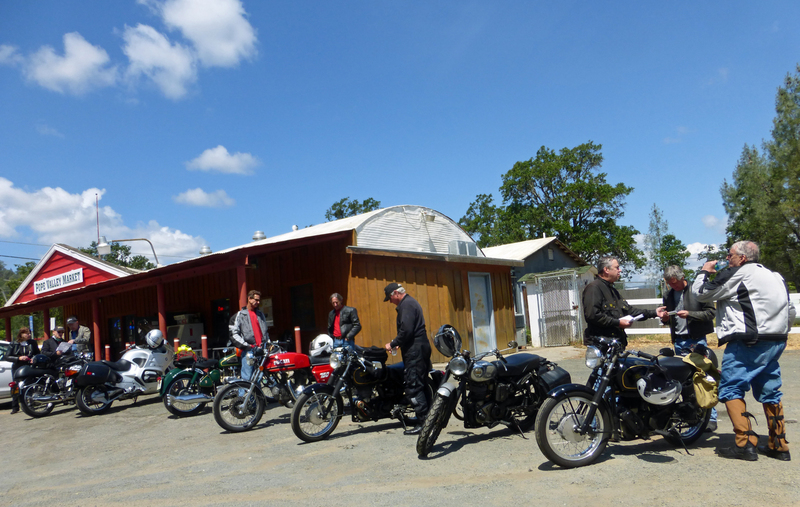 About ten of us met at the Big Red Barn on a mix of motorcycles. Frank Brennan, Lanora Cox, Jim Romain, Jeff Scott and John Sims all rode Velocettes. 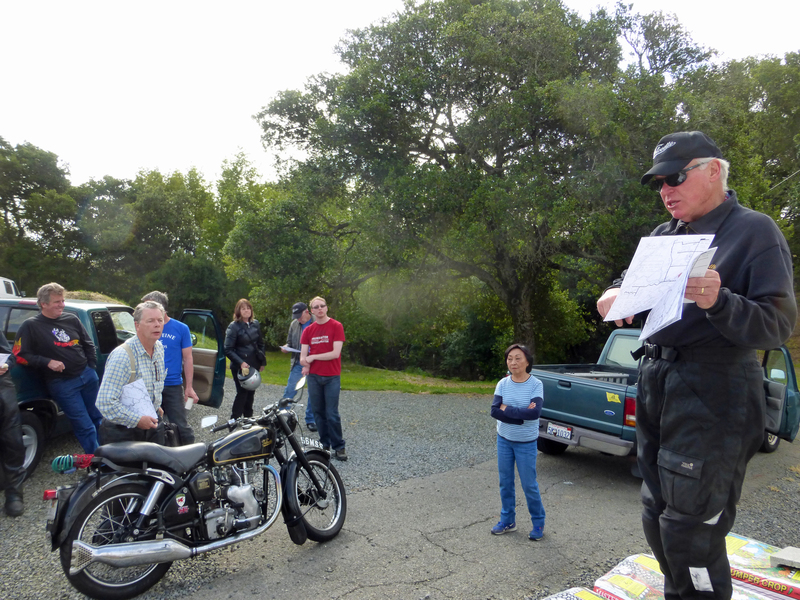 Others included Dan Brennan on a Vincent, Don Danmeier on a TsS Triumph, J. P. Defaut on a BMW and Maïa on a 1980 Suzuki, and Gus Varetakis on BSA Gold Star. 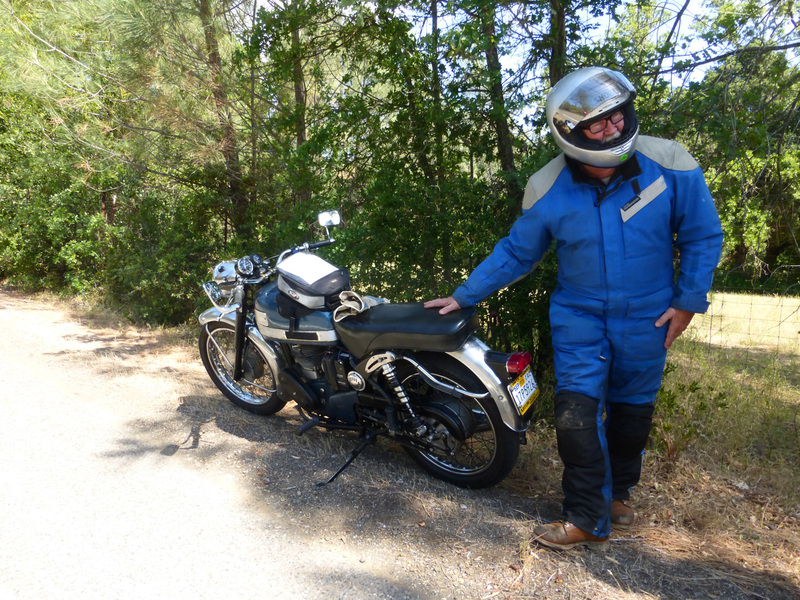 John Ray was unable to start his Velo so he began the ride on a Moto Guzzi. Down the road from his house part of a bumper fell off. (What? Did I hear that right?) Anyway Ray rode back and caught up with the gang at the gas station on a BMW. Gil Loe, visiting from Southern California and Neil Macdonald followed in a chase truck. It was definitely a winter ride; that was not the end of our troubles. My MAC had idling issues as I rode from Vallejo to Napa. We adjusted the idle screw, and that helped, but did not stop the bike from dying at stoplights and other slow speed locations. The MAC started at the gas station, but died as I rolled onto the road. I caught up with the gang on Oak Knoll Ave. As we road towards Silverado, I noticed that the brake light on Danmeier’s Triumph stayed on. Soon after we turned left on Silverado Trail, he pulled over. After closer inspection and some conversation, it was decided that the brakes could not be repaired on the side of the road and so the Triumph was put into the truck. At the Sage Canyon turn off, the Brennans were pulled over. They waved us on. Supposedly there was a problem with the Vincent that also could not be repaired on the side of the road. Just wish Frank and Danny joined us later. This was the first ride through Napa after the fires for many of us. The Thomas fire, which started terrifyingly close to Casa del Ray burned much of the landscape we were riding through. We past blackened hillsides and driveways that led to nowhere, but already nature is coming back. New growth has turned much of the burned area green. Back at the warmth of the Ray’s home, the party was going on. Sue Ray, Debbie Macdonald, and Shirley Souci started things going while others who chose not to ride brought more food and cheer. This included Frank and Elizabeth Recoder, George and Sachi Shoblo, Paul d’Orleans and Suzie Heartbreak. Daisy and Chester wore festive bells and performed their canine magic everywhere they went. My ride home had its usual thrills. Although we had the great idea of leaving before dark, it was still night time before we got home. Fortunately the lights on my MAC worked well. Still I was determined not to have the bike die while splitting lanes down highway 29. Then the main intersection near my house, and the blocks around it were closed off to police action, so I navigated an unexpected maze. The MAC performed wonderfully until the corner near my home. Good thing the MAC is easy to push! Everyone celebrates differently. Lets hope these holidays are full of Velocettes, or whatever brings you the greatest joy. For years, decades even, I’ve wanted to ride on the All Brit Ride. This annual even has been occurring on the first Saturday in November for so many years, its original purpose has been forgotten. (If you want to know, ask an old-timer.) 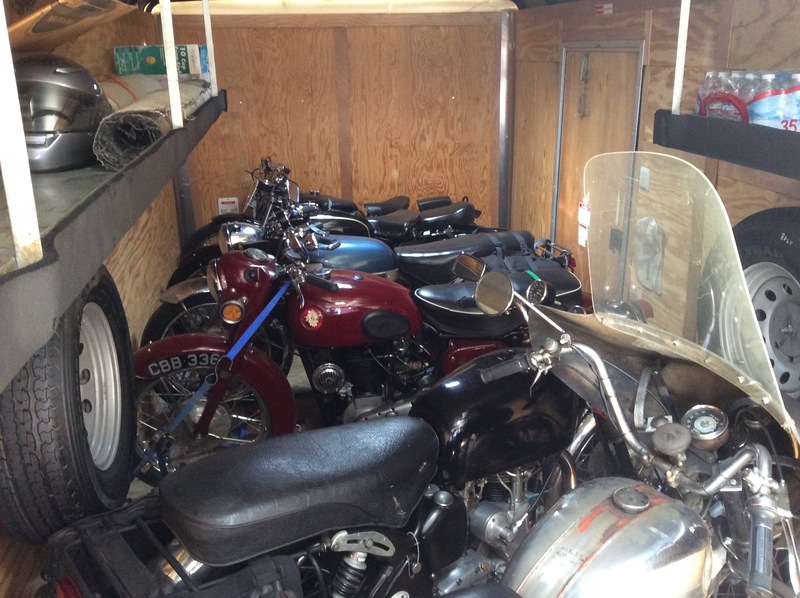 The reason my attendance has been limited to the back seat, is that the ride is not only All-Brit, but also Only-Brit, and my only British bike, a Velocette GTP is not street-ready or street-legal. This year I was once again unprepared when November rolled around. Desperate, I came up with a ridiculous plan. I could put the Scott logo on my American-made motorcycle. The Scott Motorcycle Company operated out of West Yorkshire and had an illustrious career until it went out of business in 1978. Plus Scott is my Jeff’s last name. This idea was doomed, mostly because I was constitutionally opposed to it. 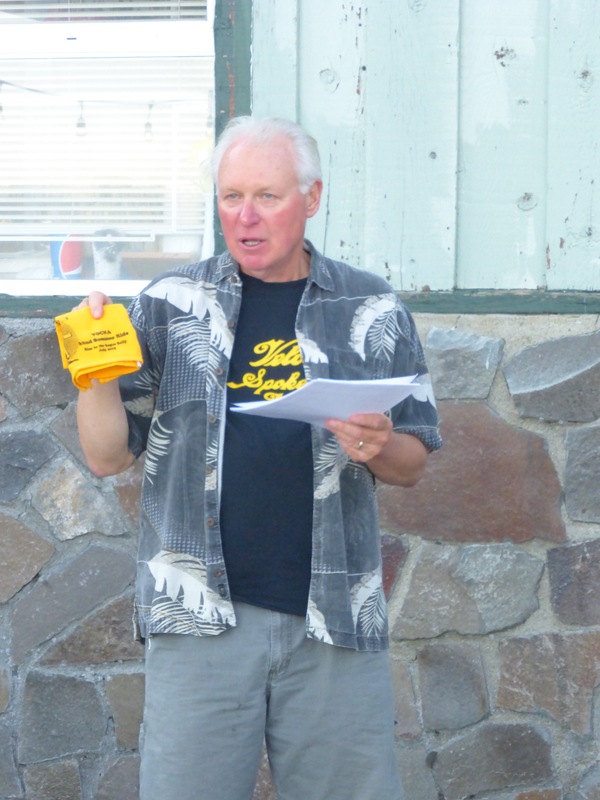 I have great respect for the ride leader, Don Danmeier. In addition I support the concept of All-Brit and Only-Brit bikes on the road. However I made some effort. I printed out the label. I got my bike out and was ready to ride when friends gathered at my house. A third factor clinched the deal. No battery. 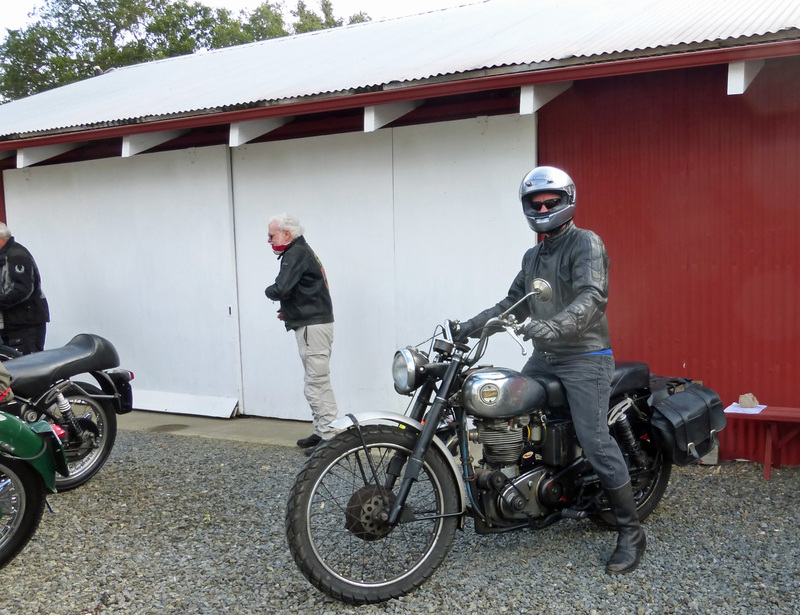 We were able to bump start the bike in the morning, but the battery did not charge up on the ride to Novato. 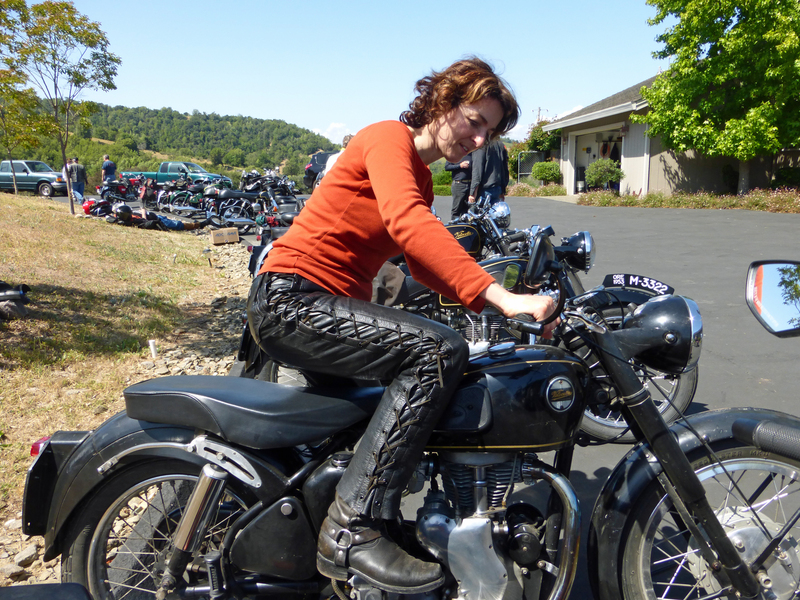 So once again, I rode to the starting point and then hopped on the back of the Velocette Endurance. Riding on the back was always a bit of a let down, until I realized I could take photos! 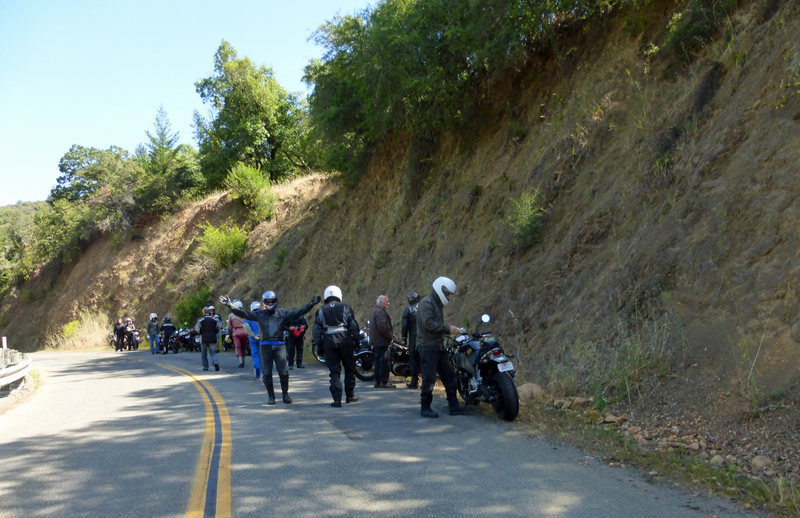 It was a glorious day to ride around the back roads of Northern California and I’m certain we all felt lucky. 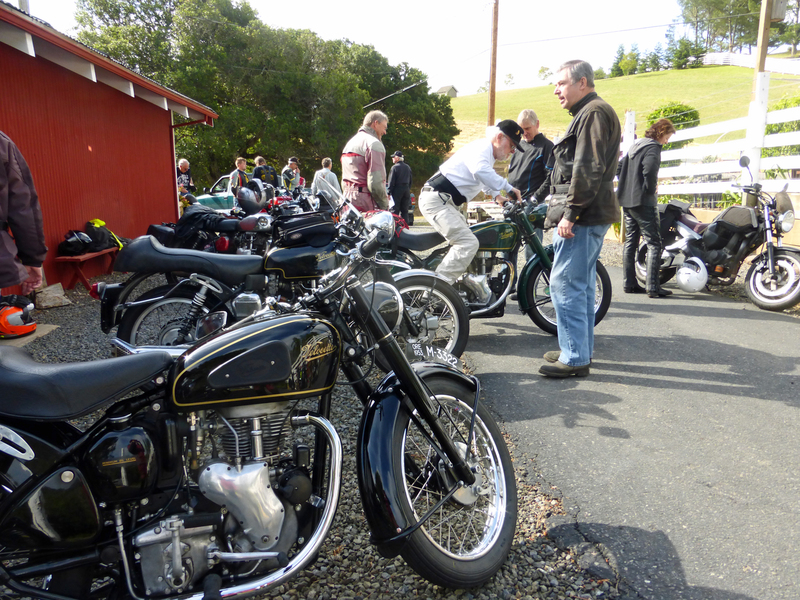 There seemed to be a good turnout of over 100 riders, many VOCNA members. The route created a figure eight in the back roads of Sonoma and Marin counties with stops at the usual places, Tomales and Bodega Bay. Instead of having lunch at the cheese factory, we gathered for a meal that couldn’t be beat at Stafford Lake Park. Here Don handed out awards. No Velos won, but some VOCNA people and my friends were prominent in the awards. Paul Adams rode the oldest bike, a 1937 Norton, and Lou Brero won the “Chrome won’t get you home award.” Ron Perconti has won the Pit Crew award so many times he had disqualified himself. 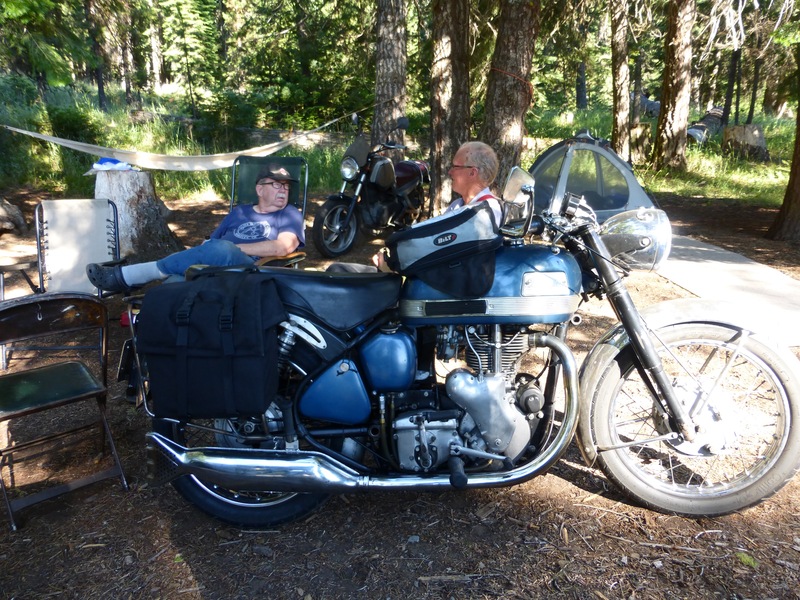 Once again Team Mork, consisting of Captain Fred, IceBreaker Ron, mate Jeff and myself traveled in style to the site of the annual Velocette Owners Club Rally, at Diamond Lake, Oregon. On the drive, I tried to predict the theme of my 2015 VOCNA Rally. The title of this year’s ride, “Rim to the Rogue,” didn’t work for me. It could be the title of a modern Romance novel, but I have enough hooligans in my life already. So what was going to be the unifying theme for me? What was waiting for me when I got off work Saturday. The team was ready to go! The Northern California landscape we drove through demonstrated drought and it’s dramatic cousin, fire. In comparison Oregon seemed lush and green. Diamond Lake was full of water (unlike the last time we were here). 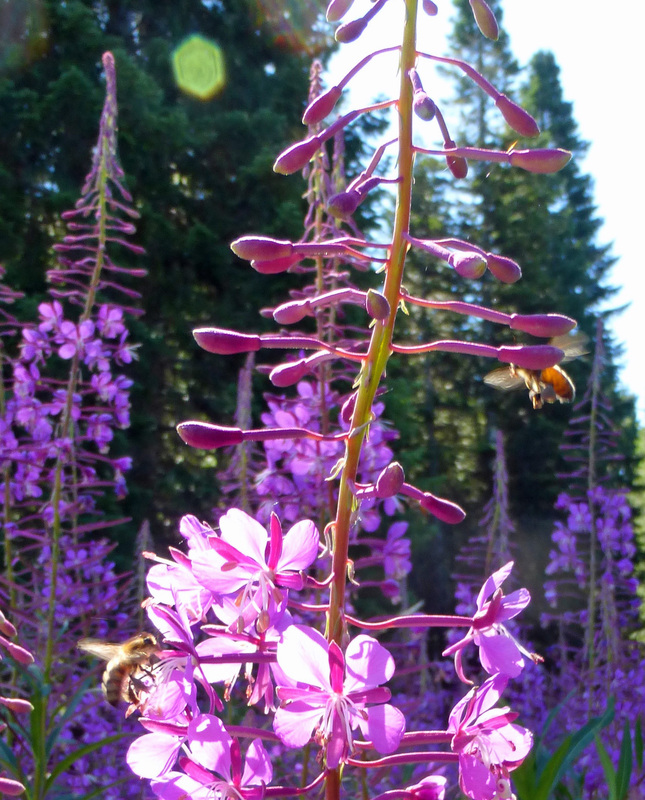 The Oregon Fireweed was blooming and attracting lots of honey bees. Fire and water. Elemental forces. hmmm…. was that my theme? As usual the first order of business after arriving and setting up the tent was to see who else had arrived and to learn who was not able to make it to this year’s rally. Many of the usual suspects were absent. You know who you are. You were missed. Fortunately there were plenty of old friends to see and new people to meet. Most excitingly Keith and Colleen were back in the United States and riding, after their terrible accident a couple of years ago. Steve too returned after his epic tumble in Idaho. In camp, we got to meet first timers: Jody and Bonnie from Ontario, Canada; and Gary and Debbie Roper from Oregon; as well as Kodiac Bill. John also suggested we remember Sam Jowett by doing two things, eating porridge for breakfast and spending the day riding under 40 miles per hour, and on another day, honor the memory of Ron Thomas by doing two things, consuming two six packs of Coors Light and riding all day over 70 miles per hour. I don’t know of anyone who managed to accomplish both of these. Meanwhile back at camp we had a couple of visitors who came round to look at the bikes. One of these visitors was Richard Vincent. He not only bought a couple of Velocettes from Lou Branch, but also raced a Velocette! These bikes meant a lot to him! He had the original paperwork from the first Velocette he bought – he was so young his grandmother had to sign for him. 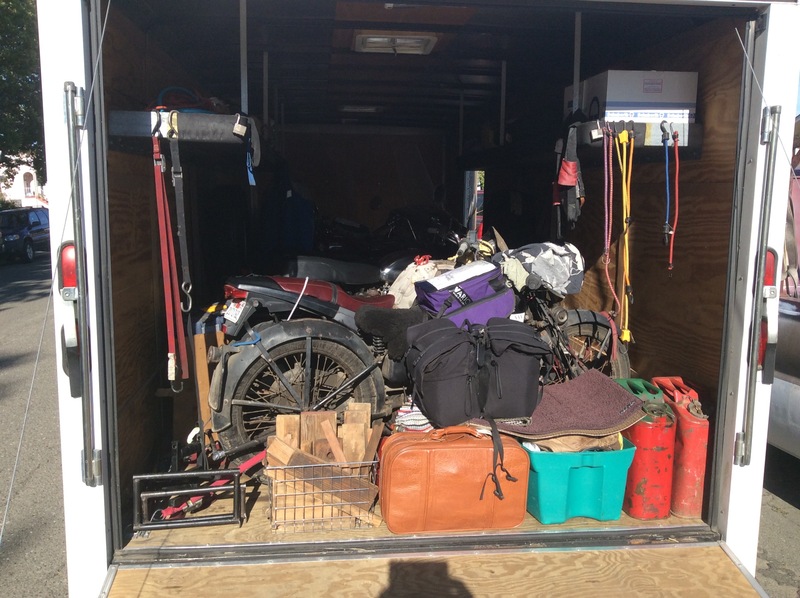 Richard visited us again in Gold Beach and showed off his racing numbers and two of his bikes. Let the fun begin! 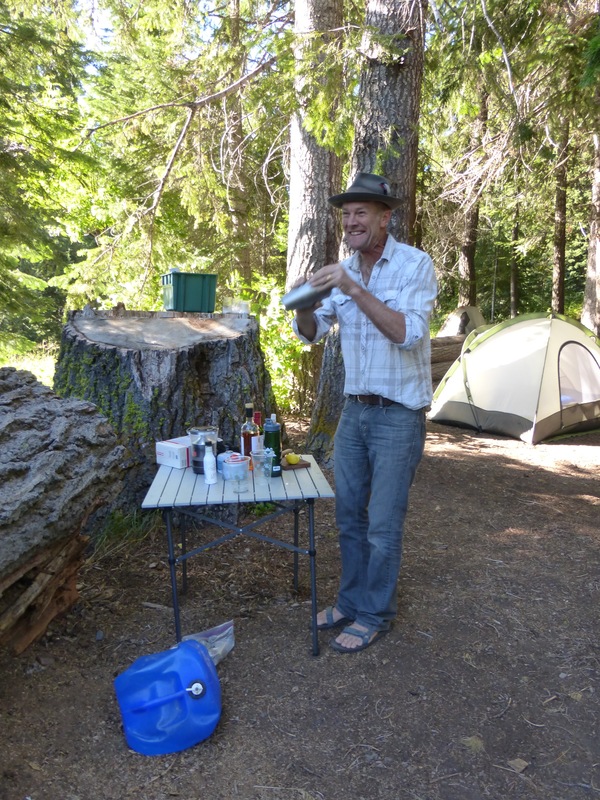 Jeff W, bartender extraordinaire! Many of the usual suspects were not able to attend this year’s VOCNA Spring Opener. What can we say? They missed out! Once again, our hosts John and Sue Ray, arranged for perfect weather. It was neither too hot nor too cold. Even the wind waited until the awards were presented before kicking up its heels. The Rays have adopted two new rescue dogs, Chester and Daisy, who added their furry selves to the mix. The route was similar to past years full of twisty back roads that avoid heavy traffic. The road surfaces however… well, we could have called this the stone-lovers ride. There were no gold rings or diamonds, but perhaps too much interaction with dirt, gravel and boulders. We all met at the Ray’s big red barn. And what a festive gathering it was. Mirek and Liam Sharp were special guests all the way from Guelph, Ontario. Mirek kindly deigned to ride Jeff Scott’s Endurance, while Liam stayed back at the house and helped set up for our return. Jim Abbott came from Arizona. John Stanley visited from Washington. And there were a lot of people from California, but this is a big state. Gil Loe, Dana Shatts and Tom Ross represented the southern California region. Tom brought a new convert, Cameron who rode a KTM. 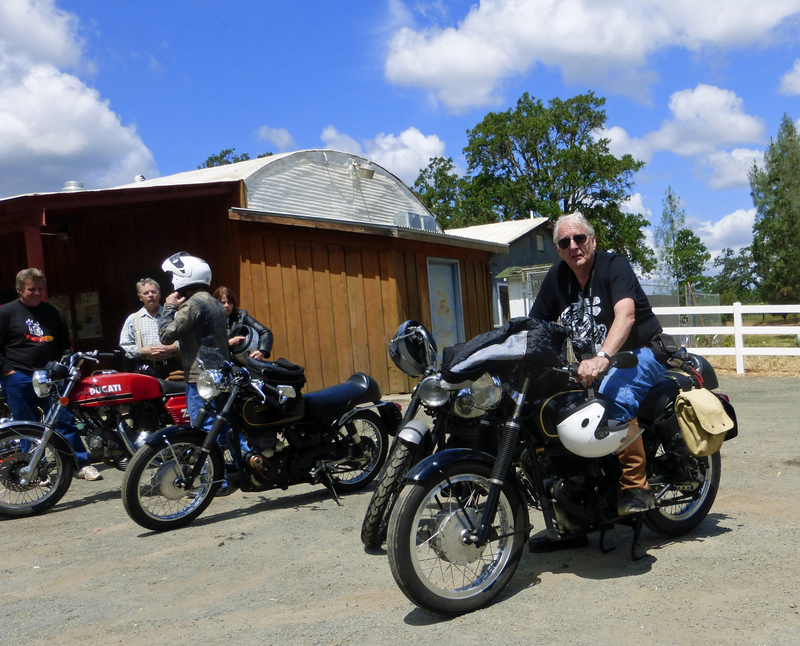 At the beginning of the day, he laughingly asked me, “Can you imagine a bunch of Harley riders celebrating just because their bikes started?” At the end of the day he was much more impressed with the riding skills and speed of the club members. John Ellis, George and Sachi Shoblo, Kent Bell and John Sims arrived from communities in the southern San Francisco region. 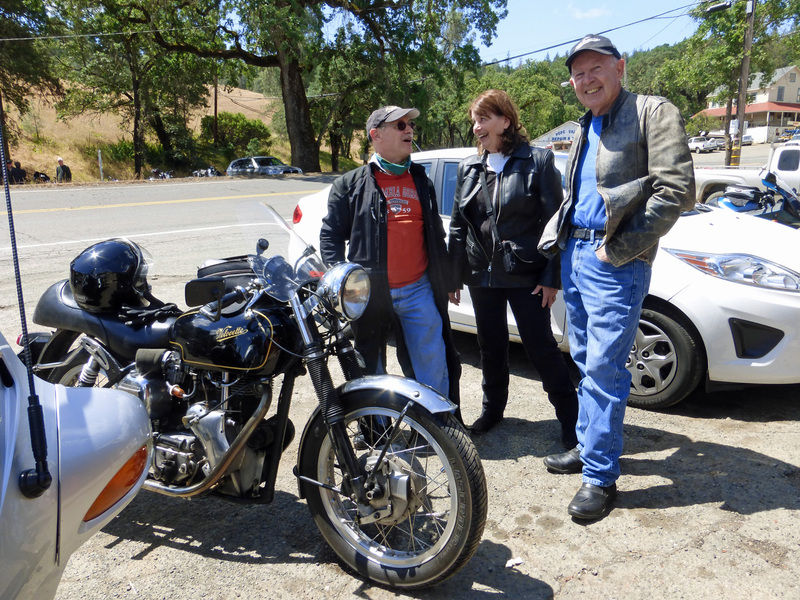 John Sims also introduced his friend Manuela who rode a Sportster. Paul and Sandy Adams came from the east. 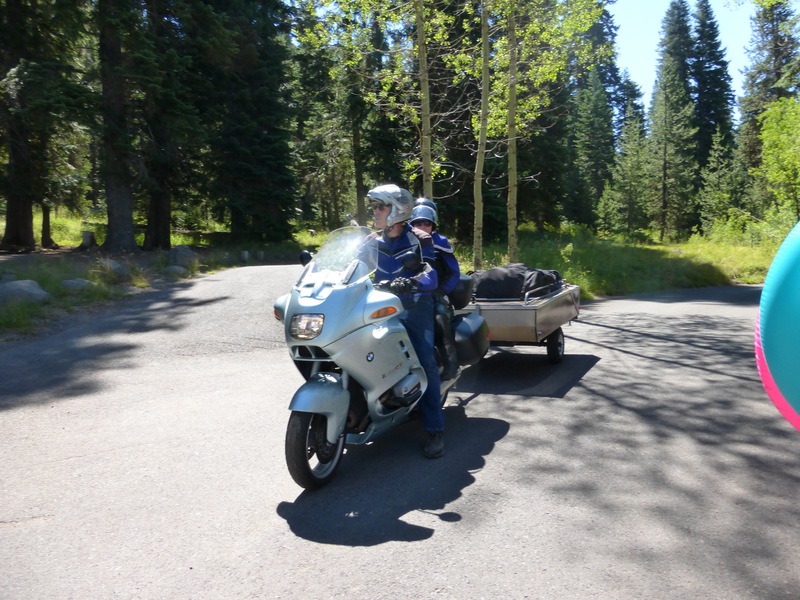 Sandy was the day’s only pillion rider and she was fearless. 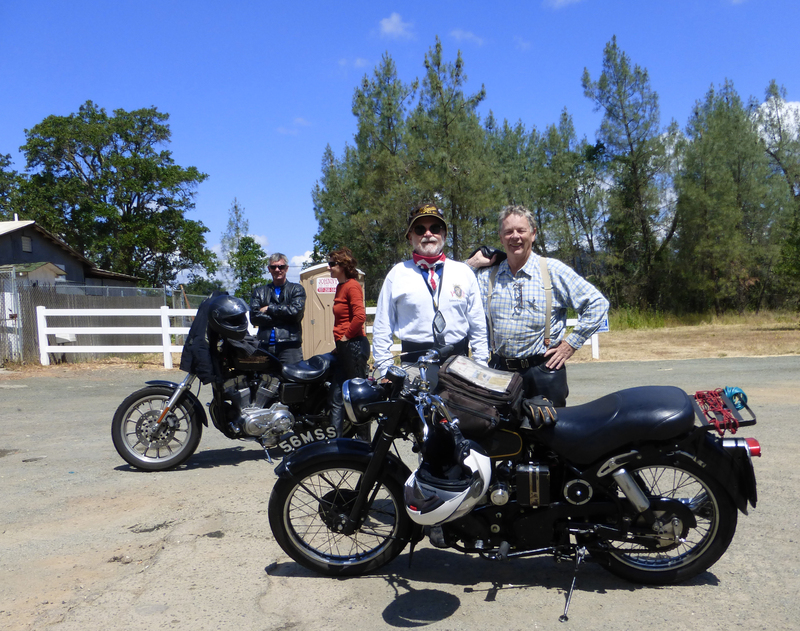 Fred Mork, Lance Leavey, Jeff Scott & I all rode in from closer Bay Area communities. All in all, nineteen bikes took off from the barn and eleven of them were Velos. Other people such as Jeff Ward, Frank Brennan and Charlie Taylor joined the ride later on the route and departed as their lives required. This year’s route followed the usual course, backwards. We stopped for breakfast and then rode down Dry Creek road. Unfortunately this wonderfully twisty road had a rotten corner hiding in it. Dirt, fine, silty, slippery dirt slid down the dry embankment and on to the road. John Ellis led the pack, lost traction and went down. As I went around this corner, I felt my tires get all squirrely just as I saw John Ellis’s bike on the pavement on the wrong side of the road. My senses were obviously mixed-up as it looked like his bike was upside down. By the time I stopped (safely) others were mumbling about ice and slipperiness. Kent Bell returned to kick as much of the dirt as he could back into the hillside where it belonged while others picked the bike up and took it to the shoulder. By latest report John Ellis had a sore leg and a broken foot peg. Show’s over. The bike is up, the rider checked. time to get moving again. 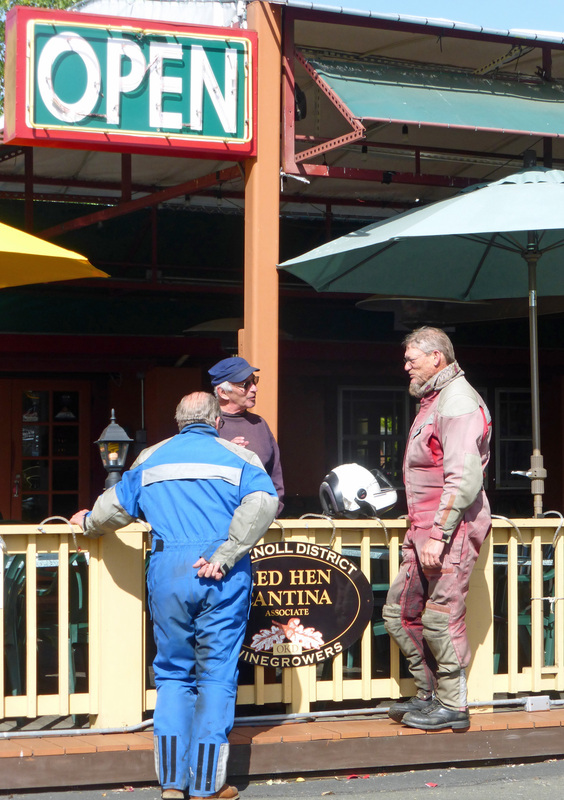 There was smooth riding after that across highway 29, up highway 128 past Lake Hennessey to Chiles Valley Road where Fred Mork’s bike stalled. He rolled safely to a shoulder on a straight section of road. While Lance Leavey stayed to help identify the problem, I rode on to catch Jeff Scott who is familiar with Fred’s bike. (Sometimes it feels like my role in life is to direct Jeff.) 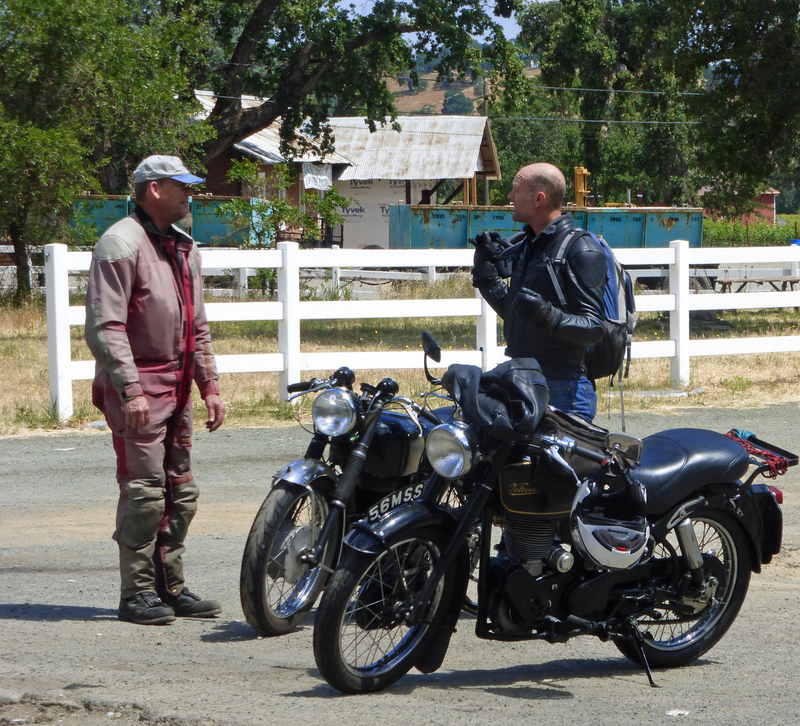 Anyway, I caught up to Jeff at Pope Valley, a scheduled stop. He went back to help Fred, but luckily didn’t have to ride far. Fred had found the problem: a high tension lead had become unseated. He fixed it enough to finish the ride and return to his home. At this stop, Jeff Ward caught up with us. According to rumor, he’d been seen at a gas station in Napa with his bike apart and oil everywhere. Paul Zell and Julie who were driving the chase truck went to check out the scene. The problem was identified as a loose gasket. Paul had the fix – an empty pizza box. Cardboard was put into service and once more oil flowed where it should in the bike. At the Pope Valley snack stop, we were entertained with the passage, twice, of some kind of high performance car club. Maserati, Ferrari, Porshe, etc were all represented. But this was no race track. There were plenty of reasons for keeping speeds down on these roads including bicyclists and the local enforcement agencies. We all stopped at Moskowite Corner and here I recognized that I was hungry and tired. Not a good combination. Plus I haven’t done any riding this year and am quite out of shape for this kind of exertion. Still we were on the home stretch. Down narrow two-laned highway 121 we went. Along the way, Jeff Scott passed me very closely and I lost my concentration. I stopped to take a breather and let other pass me. Just as I was pulling away from the turnout, I saw Lance come to a complete stop and get off his bike. Oh no! Before I found a safe place to turn around to see if Lance needed any help, I rounded a corner and there was another Velo down. Jim Abbott chose one of the few places where you can actually get off the asphalt to get close and comfortable with some boulders. Gas was pouring out of his tank while Manuela lifted the bike so Jim could get out from under it. At that moment, Manuela became my hero. Jim Abbot was determined to ride the rest of the way. Fortunately the chase truck arrived because even though all of our bikes were now right side up and on two wheels, we all needed assistance in getting turned around and back on the road. Zell was instrumental in that. 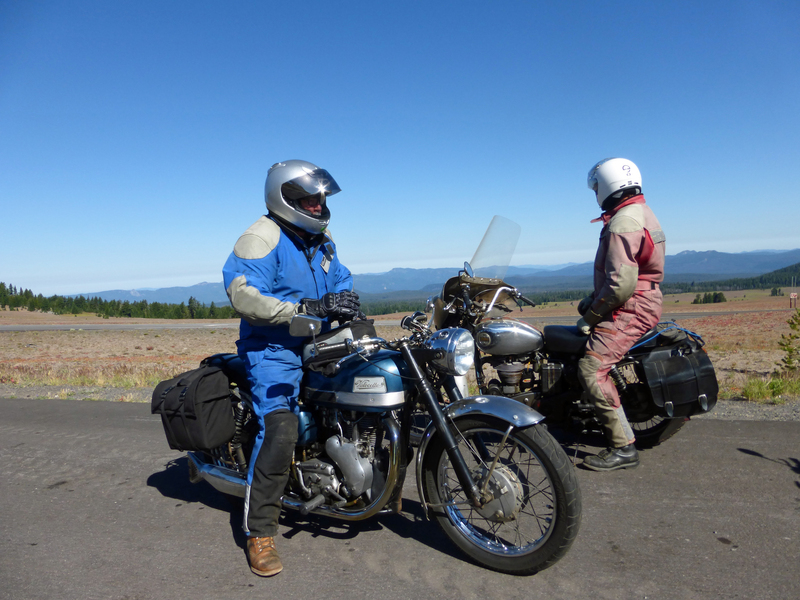 As we continued down the mountain, I focused on returning to that wonderful relaxed and alert state, that focused meditative experience you can get while riding a motorcycle, and I had an epiphany. I’ve noticed how the moods of motorcycle riders parallel the quality of their ride. To put it most simply, when the bikes are running well, riders are happy. When the bikes are not running well, the riders take it personally. This goes beyond a value judgment of mechanic skills to the point where the bike is like an extension of persona. Once I heard a woman speak of the relationship her husband had with his bike in even more intimate terms. But as I was thinking about this, I felt something, one of those things that as soon as you put words to it, the experience dissolves. But here goes. The relationship between rider and bike is not about persona or ego, but spirit. There are times when the bike and the road and the rider are all one and the sense of motion is when the spirit soars. Ok that’s not quite right, but that’s as close as I can put words to it. 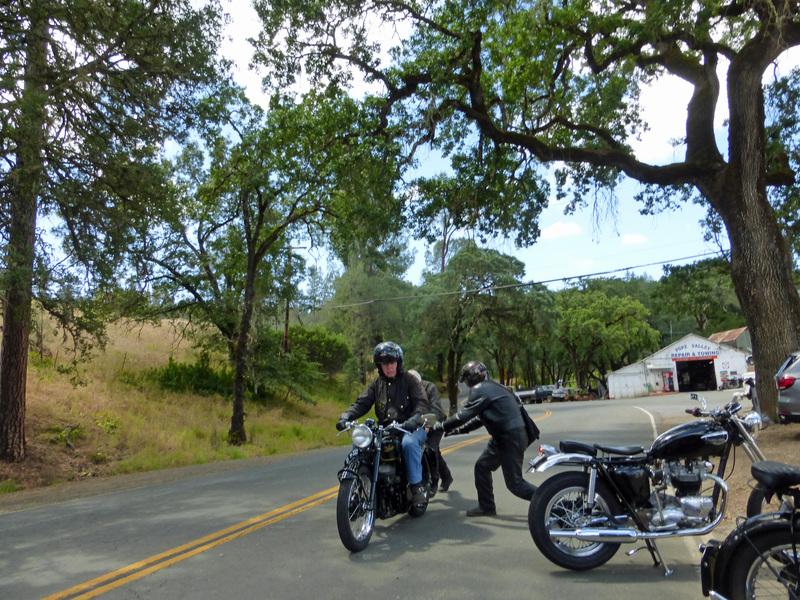 Once we’d returned to the Napa valley the ride was a battle between memory – but I’m sure we need to go left – and map – but the map shows we turn right – and somehow we all managed to make it back to the Ray’s for a screaming bbq, tire-kicking and silly awards. So that’s what you who did not attend missed out on. The excuses for not attending this year’s VOCNA Spring Opener ranged from the hoity-toity Quail event, a dirt-loving Funduro, and graduation ceremonies, to one 50th High School reunion (guess who that was!) We hope all these events were as magnificent as possible. We hope to see you all at the 2015 VOCNA Rally!